Is It Time to Buy CSX Stock? 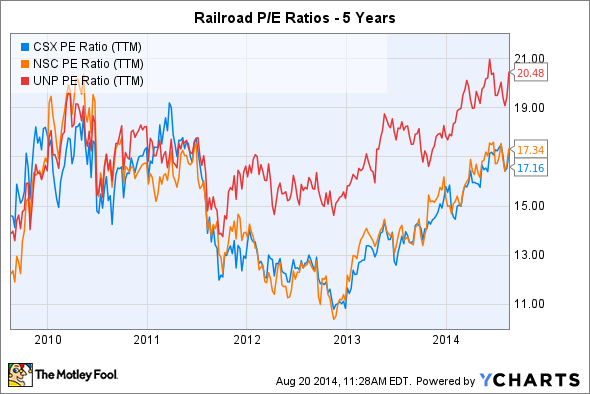 The railroad company has done a good job, but it has also lagged behind its competition. Will CSX bounce back? After a long period of stagnation in the late 1990s and early 2000s, the railroad industry has become a force to be reckoned with over the past decade. Among the biggest players in the industry is CSX (NASDAQ:CSX), which has a 21,000-mile network of railroads that extensively covers the eastern portion of the U.S. Yet even as CSX stock has climbed to its highest levels ever, it has still lagged behind competitors Union Pacific (NYSE:UNP) and Norfolk Southern (NYSE:NSC) over the past several years. Some value investors believe that makes CSX a more attractive opportunity, while other investors worry that CSX doesn't have as much potential to grow as its rivals do. Let's take a closer look at CSX and whether now is a good time to buy the railroad stock. CSX Route map. Source: CSX. The entire railroad industry has rebounded sharply from poor conditions in late 2011 and 2012, as some of the biggest headwinds the industry faced have somewhat dissipated. During those years, plunging natural gas prices led to increased demand for gas from electric-utility customers, and the trend toward converting old coal-fired power plants to use natural gas as a cleaner-burning fuel led to a sharp drop in coal prices as well. Given the prominent role that railroads have in transporting coal, lower coal volumes kept share prices in check even as earnings continued to improve, sending earnings multiples into the low teens. CSX's location in the Appalachian coal-mining region left it particularly exposed coal's decline, leaving Union Pacific and its broader geographic reach with a competitive advantage. Since then, natural gas prices have rebounded, and coal demand has shown signs of hitting bottom. Yet one thing that also helped CSX and its peers was the opportunity to transport crude oil and various raw materials necessary to support hydraulic fracturing in unconventional oil and gas shale plays across the country. With pipeline capacity proving insufficient to handle oil production from remote locations, railroads have stepped in to meet transportation needs of energy producers. Moreover, an improving economy has also helped raise volumes for consumer goods, helping CSX and its peers. Increased optimism has lifted P/E ratios for CSX to around 17. That's in line with Norfolk Southern and below what Union Pacific fetches, as investors continue to believe that Union Pacific has superior prospects from the western reach of its rail network. Can CSX keep up with its rivals? 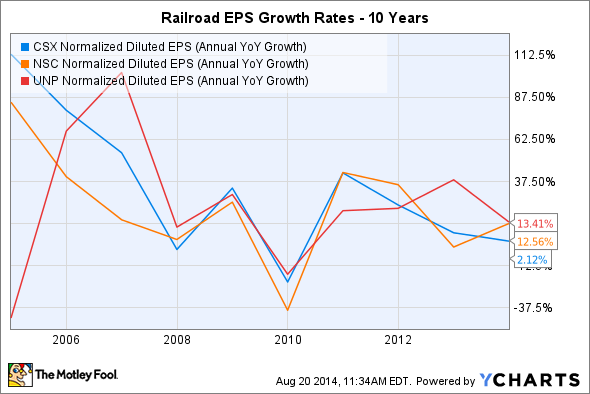 Earnings growth rates confirm the challenges that CSX has seen from Union Pacific. 2010's industrywide drop in earnings hit Union Pacific the least, and since then, Union Pacific's ability to attract energy shipments has given it better growth rates than CSX or Norfolk Southern. Meanwhile, Norfolk Southern, which shares CSX's traditional coal focus, has worked hard to take maximum advantage of the crude oil boom. With a network that offers the ability to help producers in western Canada bring their tar-sands-based energy products to refining facilities in the U.S., Norfolk Southern hopes to be instrumental in driving North American energy independence in the near future. For its part, CSX is also aiming to become less dependent on coal while still hoping that a recovery in the coal industry will help support overall volume in the future. In its most recent quarter, CSX actually ended up with too much overall shipping volume, as a big jump in car loads led to slower average speeds and longer idle periods at terminal facilities. That caused on-time arrivals to get cut in half from year-ago levels, but as CSX adapts to better overall conditions, it should be able to boost its efficiency back toward its more traditional levels. Is CSX a smart buy right now? With expectations for relatively flat earnings this year, some CSX investors might believe that it would be better to wait until expected growth in 2015 starts kicking in. Yet even though shares have already climbed in anticipation of better times ahead, CSX stock looks reasonably enough priced for long-term investors to focus more on the company's future prospects than on short-term price fluctuations.